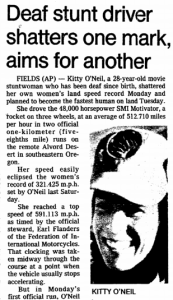 On the alkali flats of southeastern Oregon’s Alvord Desert, deaf stuntwoman Kitty O’Neil set a new women’s land speed record on December 6, 1976. For one second after she blasted off, the force of acceleration pushed Kitty’s guts gently back against her lungs, but except for this minor discomfort, the ride was a smooth one. Within five seconds she was going 180 mph. In 15 seconds she was a mile down the course, doing 500. Five seconds later she was going 200 mph faster than any landbound woman had traveled before, reaching a speed of about 600 mph and clocking 514.120 through a one-kilometer speed trap.